Samsungs 950 Pro brings retail availability to high-performance M.2 NVMe SSDs. (+) Wrigley’s Extra: Great performance; good warranty; retail availability. (-) Dubble Bubble: Still very expensive; requires M.2 slot (and NVMe BIOS for booting); needs Z170 to shine. Never mind the small size; M.2 drives have the potential to deliver a ton of performance in a compact form factor. This makes them ideal for Ultrabooks and other thin-and-light laptops, and desktop motherboards are getting in on the action as well. With SATA topping out at a theoretical 6Gbps, PCIe is the way forward, and M.2 leverages the PCIe bus to deliver up to 32Gbps. Add in support for NVMe (Non-Volatile Memory Express), an optimized protocol designed to let SSDs reach their full potential, and this looks like the way of the future. So, what’s the problem? Until now, finding retail M.2 NVMe drives has been difficult and expensive. 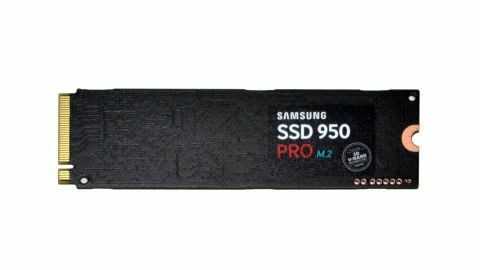 Samsung was the first to offer an M.2 PCIe SSD with their XP941, and they followed that with the SM951 earlier this year. Then they released the SM951 NVMe, a second iteration of the drive with NVMe support. Unfortunately, all of these were designed as OEM-only products, going primarily to laptop and notebook vendors where the OEM was responsible for ensuring the necessary features were in place. You could find those drives online, but typically without a manufacturer warranty and at high prices. The Samsung 950 Pro aims to change all that, with a 5-year warranty plus some stellar performance for good measure. The change of heart likely stems from Intel’s launch of Skylake and the Z170 chipset, which allows desktop M.2 to reach its full potential. For optimal performance you’ll want a Z170 motherboard with an M.2 slot that supports x4 PCIe Gen3 lanes—anything less and you’ll start bumping into a performance ceiling. Note that while the SM951 NVMe and 950 Pro might seem like the same drive at first blush, there are a few key differences, most notably the switch from planar NAND to Samsung’s V-NAND (3D NAND). When it comes to SSDs, there are several aspects to consider. Naturally, there’s the storage capacity: Do you want something that’s only for the OS, some apps, and a moderate collection of documents and images; or do you want to be able to store everything on the SSD and forget about managing disk space? Depending on the user, 128GB may suffice, but these days, we draw the line at 256GB—and Samsung does as well, with the 950 Pro only coming in 256GB and 512GB models initially, and a 1TB model planned for a future date. Those who want as much storage space as possible may find the 512GB model to be on the smallish side, which is unfortunate, and while Samsung has 2TB SATA drives (with 4TB drives coming), we’re not likely to see anything that capacious in an M.2 drive for a while. The other matter of size to consider is the physical package of the SSD. M.2 sticks are about the size of a stick of gum and nearly as tasty (so we’ve heard), but it’s difficult to fit more than 512GB onto an M.2 drive. Nearly all of the retail PCIe drives we’ve seen have standardized on the M.2 2280 form factor (that’s 22x80mm, if you’re wondering), and while it’s possible we’ll see smaller M.2 SSDs, those are more likely to be OEM-only designs for specific laptops. We might also see longer 110mm M.2 SSDs, but that creates a potential compatibility issue with desktop motherboards. Thus, 2280 is the most likely target, and it’s a reasonable balance between physical size and potential capacity. There is an issue with the size, however: cooling. With PCIe NVMe drives pushing a lot more data (up to 4x as much as SATA on the current models), the potential for M.2 drives to get a bit hot is certainly real. We’ve noticed minor throttling issues already (e.g., on both the SM951 and SM951 NVMe). Laptops have the flexibility to build around the requirements of their storage and add a custom heatsink if necessary (or dump heat into the chassis on thinner designs), but DIY desktops don’t want to block expansion card slots. Asus has one solution where several of their high-end mobos include a heatsink for the M.2 slot. There’s another possibility as well: just get a PCIe SSD like the Intel SSD 750. That’s the heavyweight of SSDs right now, with NVMe support and a heatsink to keep things running smoothly. M.2 isn’t the only solution for fast SSD storage, of course. U.2, formerly known as SFF-8639, aka SATA Express, will allow for more traditional 2.5-inch type form factors for SSDs, and there’s even M.2-to-U.2 adapters. The problem for now is that drives with U.2 connectors are relatively scarce (even more so than M.2), and the cables and connectors needed for U.2 are rather bulky and inflexible. You can also simply go with storage on a standard PCIe card, which is something we’ve seen for several years, going from RAID arrays to the latest NVMe drives. As with the SM951 NVMe, Samsung elected to send us its 256GB model for testing. Mostly that means lower write speeds, and slightly lower read speeds. The specifications aren’t all that different from the SM951 NVMe, and in fact, the write speeds are slightly lower. The benefit, of course, is that the 950 Pro is less expensive, both to manufacture and to purchase, thanks to the use of V-NAND instead of planar NAND. But how do the raw specs translate into actual performance? For our SSD testing, we’re running a Skylake processor in a Z170 motherboard. Below are the full specifications. In terms of price per GB, there’s a big gulf between SSDs and HDDs, and a moderate gulf between SATA and NVMe SSDs. At the top of the ladder, the Intel SSD 750 runs $900 for 1.2TB SSD and $350 for 400GB—so a range of $0.75 to $0.875 per GB. The new 950 Pro is a bit better, priced at $200 for 256GB and $350 for 512GB, or $0.684–$0.781 per GB. Either one is a pretty tough pill to swallow, especially when you can get 2TB for just $710 ($0.355 per GB); the least expensive (decent) SSDs, meanwhile, will run as little as $160 for 500GB ($0.32 per GB). So at best, the current crop of NVMe drives basically double the cost per GB. If you’re wondering, the lowly hard drive continues to provide vast quantities of storage at bargain prices, with the least expensive HDDs going for around $0.03 per GB—a full order of magnitude difference (with an equally large difference in performance). Both the earlier Samsung SM951 and the new 950 Pro have a feature called Dynamic Thermal Guard. In certain heavy workloads, it’s possible for the NAND chips and controller to heat up and potentially malfunction, so the 950 Pro may throttle at times to avoid overheating. Samsung states that it “do[es] not anticipate any performance drops due to thermal throttling,” but we found that performance was up to 10 percent higher in random write tests when we had a fan blowing at the drive. It’s not a huge difference, but it’s something to keep in mind; our charts show the performance with the fan blowing over the SSDs. The 950 Pro is fast, certainly, but it can’t quite top the Intel SSD 750 in many of our benchmarks. Part of this is the smaller form factor of M.2, part of it is due to capacity, and some of it just comes down to controllers and features. The SSD 750 is a performance monster, but it also takes up a PCIe slot and has a heatsink. In contrast, the 950 Pro is tiny and tucks away in between PCIe slots on most motherboards. The 512GB model 950 Pro would be higher up the charts, but it’s unlikely to catch the 1.2TB Intel SSD 750—though it would be interesting to see the 400GB Intel as a comparison point. Even at 256GB, however, Samsung wins out in the real-world file copy and PCMark 8 tests. There’s also the compatibility aspect; the SSD 750 will work in virtually any motherboard (note that you still need NVMe BIOS support if you want to use it as your boot drive). The 950 Pro, on the other hand, is a viable option for laptop users, and we expect to see it used in many laptops during the next year. Samsung’s 950 Pro may not win out in pure performance, but with better pricing and availability, it’s an easy win for anyone looking for an M.2 NVMe drive. It’s a jump in pricing compared to SATA offerings, and it’s clearly geared toward recent hardware platforms. But if you’ve got the funds and the necessary M.2 connector and NVMe BIOS support, the 950 Pro makes even the best SATA drive look sluggish.